The global insulation materials market is expected to reach $53,360.5 million by 2021, growing at a CAGR of 6.2% between 2016 and 2021. This enormous growth is being anticipated due to the various benefits provided by insulation materials such as environmental benefits, emission reduction, less energy consumption, and the material’s potential to be recycled and reused. Insulation materials are designed to reduce the heat flow by limiting heat transfer through conduction, convection, and radiation while facilitating vapour flow and water condensation of a process. The insulation materials such as mineral wool, polyurethane foam, polyethylene, extruded polystyrene, expanded polystyrene, polyvinyl chloride, and fiberglass help in insulating the building envelop, reduce energy consumption, and reduce the emissions of greenhouse gas, and offers comfort and safety. These insulation materials find use in residential construction, non-residential, HVAC and OEM, oil and gas, wires and cables, and automobiles. The insulation materials market is expected to grow at a CAGR of 6.2% and 7.2% ($milllion) and (kilotons) between 2016 and 2021. The report is a compilation of the different segments of global insulation materials market, including market breakdown by insulation materials type, end-user industry and geographical areas. Herein the revenue generated from the insulation materials types, namely: polyurethane foam, mineral wool, expanded polystyrene, polyethylene, extruded polystyrene, and polyvinyl chloride; end-user industry, namely residential construction, non-residential, wires and cables, HVAC and OEM, automotive, and oil and gas; and geography, namely: North America, Europe, Asia-Pacific, and Rest of the World is tracked to calculate the overall market size, both in terms of value ($million) and volume (kilotons). The report also provides market numbers and analysis on cross segments which includes country by end-user industries. While highlighting the key driving and restraining forces for this market, the report also provides a detailed summary of the global insulation materials market. It also includes the key participants involved in the industry at the relevant sections. • What is the size, in terms of value ($million) and volume (kilotons) of global insulation materials market in 2016, and growth rate during the forecast period, 2017-2021? • What is the market size of different types of insulation materials ($million and kilotons) and their growth rate during the forecast period, 2017-2021? • How will each end-user industry of insulation materials market grow during the forecast period and what will be the market size ($million and kilotons) of each of the end-user industry by the end of 2021? • What is the market size for different regions and countries in terms of value and volume ($million and kilotons) in the insulation materials market and their growth across the forecast period, 2017 to 2021? • What is the market size for different regions by type and end-user industry in terms of value and volume ($million and kilotons) in the insulation materials market and their growth across the forecast period, 2017 to 2021? • What is the market size for different countries by end-user industry in terms of value and volume ($million and kilotons) in the insulation materials market and their growth across the forecast period, 2017 to 2021? • What are the major driving forces that tend to increase the demand for insulation materials market during the forecast period? 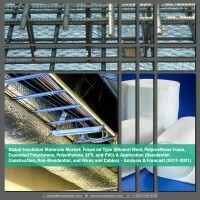 • What are the major challenges inhibiting the growth of the global insulation materials market? • What is the competitive strength of key players in the global insulation materials market by analyzing through market share analysis? • What are the key market players in the market, along with their detailed analysis & profiles (including their financials, company snapshots, key products & services, and SWOT analysis)? The report further includes a thorough analysis of the impact of the Porter’s five major forces to understand the overall attractiveness of the industry. The most commonly used strategy for developing a better hold on the market has been through business expansions. Moreover, the company profile section highlights significant information about the key companies involved along with their financial positions, key strategies & developmental activities of recent years. Further, the report includes an exhaustive analysis of the geographical split into North America, Europe, Asia-Pacific (APAC), and Rest of the World. Each geography details the individual push and pull forces in addition to the key players from that region. The prominent players operating in the global insulation materials market are BASF SE, Huntsman Corporation, Knauf Insulation, Johns Manville, Nova Chemicals Corporation, Cellofoam North America Inc., and Dow Building Solutions, among others. 8.4 Cellofoam North America Inc. The construction industry dates back to the early 1600s when the basic materials such as animal skins, fur, wool, and plant related products were used for enveloping the buildings. The construction industry has proven to be one of the major sources of pollution, accountable for approximately 4% of particulate emissions, 30% of the greenhouse gas emissions, and constitute for more than 4% of the water and noise pollution. The construction industry contributes to more than 30% of all the global emission sources. Along with the rising pollution levels, rapid population growth and high energy consumption are the other key concerns of various regulatory bodies across the globe. According to the Intergovernmental Panel on Climate Change (IPCC), an international body for the assessment of climate change, set by the United Nations Environment Programme (UNEP) and the World Meteorological Organization (WMO), buildings are the largest energy-consuming sector with nearly 40.0% of the global electricity consumed and are responsible for approximately 36.0% of the global carbon emissions (CO2). This is because of the inefficient thermal insulation systems around the building envelop which lead to significant loss of energy. Similarly, according to the European Union (EU), buildings in Europe consume approximately 40.0% of energy and produce approximately 35.0% of greenhouse emissions. Thereby, the European Union has recognized the construction segment to be the largest untapped area for energy savings in both the new and existing buildings. It has undoubtedly been the root cause of degradation the built environment. Thus, high energy consumption and its related costs are one of the major concerns for the regulatory bodies in the recent years. With the advent of the technological era, the construction methods, materials, and insulation materials have developed considerably. Insulation materials are primarily any material or substance which assists in preventing heat, electricity and noise from entering or leaving the premises. Some of the significant insulation materials used are mineral wool, expanded polystyrene, extruded polystyrene, polyethylene, and fiberglass, among others. The insulation materials are widely used in the construction, oil and gas, wires and cables, and automotive industries, among others. The major drivers for the global insulation materials market are significant reduction in energy consumption and its related costs, stringent regulations to reduce greenhouse gas emissions and increase of net zero energy buildings, and population growth and urbanization. However, volatile raw material prices and lack of awareness about insulation materials in the construction industry may hamper the growth of the market. There is a tremendous potential for the growth of insulation materials in the global market owing to the rising demands from end-user industries such as HVAC and OEM, oil and gas, wires and cables, and automobiles, among others, rising concern for changing climatic conditions and global warming, and increasing energy conservation regulations and greenhouse gas emission reduction targets. Some of the key players in the global insulation materials market include BASF SE, Huntsman Corporation, Knauf Insulation, Johns Manville, Nova Chemicals Corporation, Cellofoam North America Inc., Dow Building Solutions, Rockwool International A/S, Saint-Gobain S.A., Covestro AG, Kingspan Insulation, Owens Corning, Armacell International S.A., URSA Insulation, S.A., GAF Materials Corporation, and Evonik Industries AG, among others. These companies provide a broad product portfolio for specific needs of the insulation industry and have strong presence in the North America, Asia-Pacific, and the European region. They cater to a global clientele by collaborating with well-established distributor and sales network. The global insulation materials market is expected to reach $53,360.5 million by 2021, growing at a CAGR of 6.2% between 2016 and 2021. This enormous growth is being anticipated due to the various benefits provided by insulation materials such as environmental benefits, emission reduction, less energy consumption, and the material’s potential to be recycled and reused. These factors have contributed to the colossal demand of the insulation materials. Additionally, an increasing number of applications of insulation materials owing to their emission reduction potential, the building rating systems, stringent government regulations & emission control norms, and large-scale investment by government and federal agencies are some of the other factors propelling the growth of insulation materials market globally. The insulation-based buildings are assessed on the basis of certain parameters of energy, environment and ecology, considering both the social and technological aspects of all the projects, by the environmental assessment bodies such as Leadership in Energy and Environmental Design (LEED), Building Research Establishment Environmental Assessment Method (BREEAM), Green Rating for Integrated Habitat Assessment (GRIHA), Green Globes, Energy Star, among others. The building performances are evaluated during the initial stages of a project and the results are incorporated in the future design developmental stage of the building. Insulation materials are designed to reduce the heat flow by limiting heat transfer through conduction, convection, and radiation while facilitating vapour flow and water condensation of a process. The insulation materials can be of the following types such as mineral wool, polyurethane foam, polyethylene, extruded polystyrene, expanded polystyrene, polyvinyl chloride, and fiberglass. In 2016, mineral wool dominated the global insulation materials market as it serves as an excellent insulation material for thermal and acoustic insulation which are mainly used in residential and commercial buildings. On the other hand, the increasing demand of polyurethane foam as an insulation material from the construction sector is because of its light weight, ease of installation, reduced transportation costs, and low maintenance costs. Insulation materials have applications in a vast range of end-user markets such as wires and cables, residential construction, non-residential, HVAC and OEM, automotive, and oil and gas, among others. Insulation has been one of the most cost-effective solution to reduce energy consumption in the residential buildings. This increasing demand of insulation materials from residential construction segment is because of increasing need of reducing the energy consumption in the residential segment. Increasing construction expenditures in Asia-Pacific region along with the government initiatives to reduce greenhouse gas emissions is expected to increase the demand of insulation materials in the residential construction segment. The demand for insulation materials vary according to various geographical regions. The insulation materials market holds a prominent share in various countries of North America, Asia-Pacific (APAC), Europe, and Rest of the World (RoW). The Asia-Pacific market accounted for major share in the total revenue in the year 2016. The region is reported to have highest growth rate as compared to the others because of the high growth in the automotive, construction, and telecommunication industries along with rapid industrialization and digitalization. Increasing insulation demand from the Asia-Pacific region is majorly attributed to growing automotive, construction and industrial sectors. Additionally, low cost of setting up of manufacturing facilities and low cost of insulation materials in the region further propels the demand of insulation materials in the Asia-Pacific market. The global insulation materials market is a highly competitive industry, with all its players competing to gain a greater market share. Rockwool International A/S, Knauf Insulation, Covestro AG, Owens Corning, and Saint-Gobain S.A. are some of the leading companies in this market. Most of the insulation materials manufacturers are of the similar financial capability and the landscape is extremely competitive because of the presence of a large number of players in the market. Therefore, innovation and development has been the key for gaining growth in this market. To increase the global footprint, insulation material manufacturers are also entering new product launches, and mergers & acquisitions with different distribution networks. For instance, in November 2017, Rockwool International A/S started the construction of a basalt mineral wool production plant in Romania with an investment of $55.3 million. The expansion is expected to help the company move towards fire safety and energy efficient buildings. Additionally, in October 2017, the company purchased 180,000m2 of land in the eastern Swedish municipality of Eskilstuna. The expansion is done with an aim of future expansion of mineral wool production capacity and meet the future demands. Other key players operating in this market have ramped up their product launch activities over the recent years, to generate public awareness about their existing and new products and technologies, and to compete with the competitors’ product portfolio. For instance, in August 2017, Knauf Insulation launched a system called Supafil Frame to automate the installation of blown glass mineral wool during off-site manufacturing. The system is expected to reduce the time required to insulate modular homes. Similarly, in December 2014, BASF SE changed its entire polystyrene-based insulation product portfolio as per the European market to the new polymeric flame retardant (PolyFR). The change is in compliance with the REACH regulation which restricts the use of hexabromocyclododecane (HBCD) as a flame retardant as of 21 August 2015. Moreover, extensive R&D activities and appropriate regulatory environments are also a prerequisite for the sustained growth of this market. Various government and private research institutes, and favorable trade policies are putting in substantial efforts to reduce the energy consumption and increase the awareness about insulation materials and its benefits among the consumers.